Me too. It has seen me through some really hard times. Interesting bus ride analogy. I like it. That said, when I hear someone talk about fate, predestination, or say “my destiny is [whatever],” to me it means that they believe that they are where they are and are doing what they’re doing because it was preordained by some higher power (something outside of themselves). If you believe that, then you believe Donald Trump was destined to be president, for example, because this “higher power” preordained it. Or that the shooter in New Zealand was meant to do what he did because it was all part of the “higher power’s” plan for him. It’s those kind of beliefs — that everyone is where they are doing what they’re doing because that’s where fate (or the bus) led them is what gives me pause. I don’t think so. I think we respond to events that occur as we ride along our path and our reactions, responses — and those of the people around us change the direction in which we are going. There are always forks in the road and who is to say that how we behave does not change the route? If someone has that answer, I’d like to hear about it because I don’t know. What I do know is that we aren’t driving the bus. We aren’t going where we plan. We aren’t controlling our own fate nor am I sure there is an ‘intended fate.” Only a collection of possibilities — the “coulds” and “might-bes” of life. 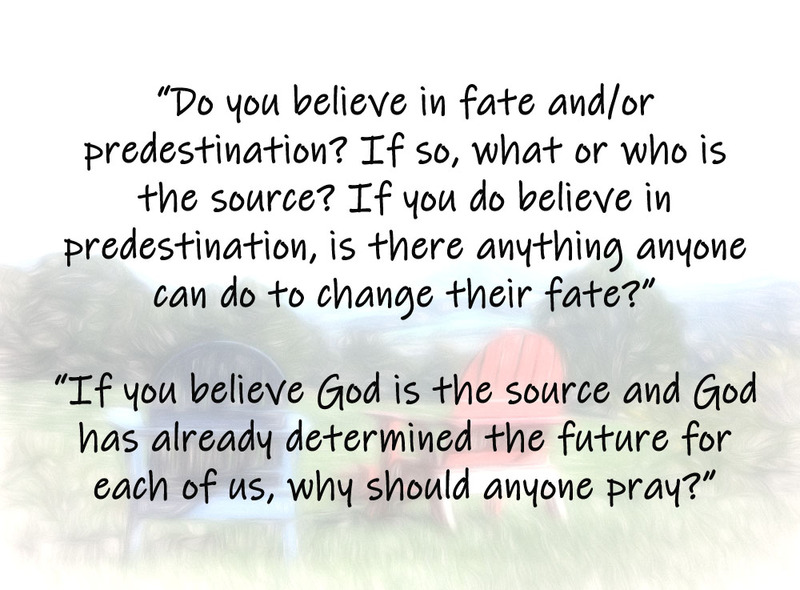 If you think that is the same as predestination, that is your decision, but it isn’t mine. I don’t believe in predestination at all. At every turn, at every fork in the road, we make choices, and I don’t believe our choices are preordained. No, not pre-ordained … but we do have leanings — drives if you will — to one direction or another. We are artistic or mathematical, literary or musical. We have distinct personal abilities and tendencies to be this way or another. Some of us are geniuses in one field or another. We will find our way into that “thing” — whether it’s being a world-class businessman or a world-class drug dealer. Regardless, you have a powerful business sense and it will take you down some road where numbers and business matter. There are violent people who will find a way to kill — while others urgently need to cook and want to feed the world. It may not be predestination, but to a person who feels this need, it may certainly seem pre-destined. I know a lot of artists who feel that they were absolutely COMPELLED to be artists. Driven to it. Writers too. Musicians who absolutely HAD to make music and literally cannot imagine doing anything else. Doctors who were born to heal. Seriously spiritual people, regardless of how you personally feel towards them (you aren’t their judge and they are not YOUR judge, either). I don’t think this is predestination. No “thing” or “individual” causes it, but whatever it is that makes us who we are, drives us to BE who we are. Some of us are more driven than others. Then there are the undriven folks who drift and wonder why nothing seems to “stick for them. I think they are the saddest folks because there is nothing which calls them to be anything in particular. They must feel lost in a world where everyone else has “business” and they don’t. Hi, this was quite an interesting post. The only problem is, time and again I tend to ponder over this topic, but have never been able to make a decision. I suspect there really aren’t any decision to BE made. We go where we go and what happens is what happens. How we respond to it changes our direction more than the event, I think. That is (maybe) our test. An interesting analogy. Life and a bus ride are pretty similar. it’s the understanding that we are on a ride and we don’t know where we are going. AND we are not driving. We go where the bus goes, which is sometimes where we want to go … and frequently not. I agree it’s a bit of a bus ride. The unknown part of it amounts to free will. Unfortunately we don’t know the end game of our choices. No, we don’t know. We take our best guess and hope for the best. The older we get, the more likely it is that we ARE doing the right thing. That’s why later marriages tend to work out better. You have cast the bubble from your brain. Yeah. I had a LOT of bubbles to cast out! Many, many bubbles. I hesitated to read your post BEFORE doing Fandango’s question, but I did. I’m glad I did. You used such a great analogy in that bus ride and our ‘destiny’. Destiny is what we can do, what we are allowed to do, able to do, want to do. And hopefully that the bus doesn’t fall off the bridge!